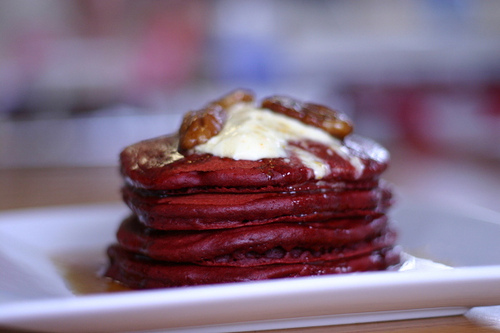 Juneberry Lane: A Weekend Treat: Red Velvet Pancakes! I know, I know, you all have New Year's resolutions to keep, but Saturday is a 'free day', right? 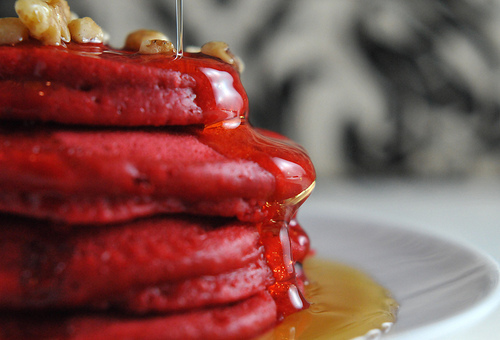 And you know what would be a great way to indulge during your favorite weekend breakfast? 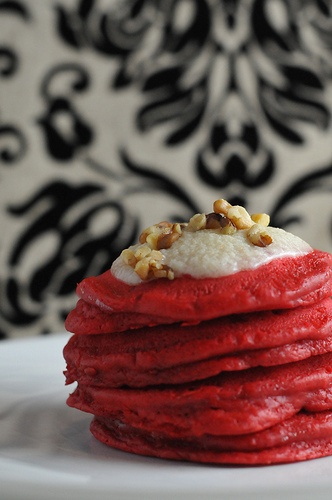 Whipping up these delicious red velvet pancakes!! Take a look . . .
~ Cook walnuts in a skillet at medium-high heat for 3 to 5 minutes, stirring frequently. In a large bowl whisk together the dry ingredients. In a separate bowl whisk together the eggs, buttermilk, creme fraiche, melted butter, red food coloring and vanilla extract. Add in the dry ingredients and walnuts (reserve some for garnish) and whisk until combined. The batter will have a thick consistency. ~ Heat a frying pan or griddle over medium heat. Add butter to grease, followed by a small scoop of the batter. Wait for the pancakes to bubble, flip and cook for another minute or two. Meanwhile, mix all of the ingredients for the mascarpone topping together and garnish along with maple syrup and remaining walnuts.